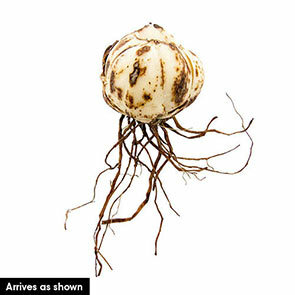 Spice up your garden this summer with the Asiatic Lily Mixture Super Sak. These perennial flowers burst forth in an array of bright colours, such as bubblegum pink, sunny yellow, cayenne red and sweet coral. This collection of bi-coloured beauties even boasts speckles of other hues around the stamens. Blooming in early to midsummer, these hardy perennials naturalize easily and will increase each year. Asiatic lily bulbs (lilium asiatic) grow well in zones 3 to 8, and take their best root in well drained clay, sandy, or loamy soil. They flourish in full sun, but can tolerate spots that get half sun and half shade. It's best to plant them between 9 and 12 inches apart and 6 inches deep. They have a spread of about 1 foot and grow between 24 to 36 inches tall, making them a great option when staggering the height of blooms in your garden. These Asiatic lily perennials, with their warm, tropical hues, make beautiful companions for gladiolus, peonies and Oriental lilies. 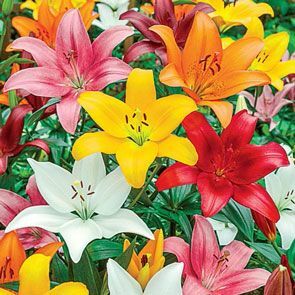 Add this mixture of lily bulbs to fence lines, foundations or tall borders for a bright, summery show. Place them in the middle of tiered beds, where their median height will blend well with shorter plants like dianthus and taller irises and Oriental poppies. Turn up the heat with the Asiatic Lily mixture Super Sak. Spicy shades of hot, tropical colours make these Asiatic lilies perfect for your summer garden plans. Very hardy and so easy to grow. Naturalize easily, so you'll appreciate even more of these generous blooms each year.